Ysbyty Ystrad Fawr ... Groundbreaking! Watching any collection of civic dignitaries at an event can leave one wondering whether sliced bread used to be the best thing since sick bags. Nonetheless, on this occasion I'd urge you to click "Play" because some of the hype is justified ... and the sheepish "JCB grin" is always one of the high spots of the day. CONSTRUCTION work on a hospital billed as the blueprint for the future of the NHS in Wales is expected to be completed by autumn 2011. The £172m Ysbyty Ystrad Fawr in the Rhymney Valley is the biggest new hospital to be built in Wales for 30 years. 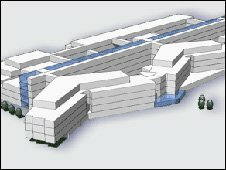 It will be the first UK hospital providing single rooms for every patient, each with a television and en-suite bathroom. It is one of a generation of new Welsh NHS hospitals serving the Valleys in the old Gwent and Mid Glamorgan areas. The 255-bed hospital will serve Caerphilly County Borough and its 170,000 population and replace all hospitals in the area, including the Caerphilly Miners’ Hospital. Its single rooms are aimed at providing extra privacy and cutting the risk of infections spreading which can result from the old-style ward structure. This is one of a number of new hospitals that are in the pipeline. As well as Ysbyty Ystrad Fawr there will be Ysbyty Aneurin Bevan in Ebbw Vale, Ysbyty Cwm Rhondda in Llwynypia and the Cynon Valley Community Hospital at Mountain Ash. The other important thing to note is that these new hospitals are not being built and funded through PFI, but directly by the Welsh Government. The lifetime cost of PFI, not least in maintenance terms, is something like twice the cost of conventional funding, so I think Wales is definitely doing the right thing. If we do something that costs half as much, we'll either get twice the number of facilities, or be able to spend the extra on services within those facilities. Long term, the Welsh and English NHS models are moving apart, not just on PFI but also on the internal market, and I'm convinced we have the better model. Re: Ysbyty Ystrad Fawr ... Groundbreaking! Good news often seems to be followed by disappointment. In this case the news that one of the new hospitals due to be built as part of the Gwent Clinical Futures programme has been put on hold. Health officials have been asked to look again at a planned £292m critical care hospital in south east Wales. The specialist hospital in Newport or Torfaen was part of Gwent NHS Trust's Clinical Futures strategy, which includes six local hospitals. But Health Minister Edwina Hart wants more work to show the plans are "ambitious, right and deliverable". The location of the new hospital was expected to be at Newport - near the existing Royal Gwent Hospital on an old steelworks site, or at Llanfrechfa Grange in Cwmbran. The new hospital services vision would mean a network of six local hospitals, including the new Ysbyty Ystrad Fawr in Caerphilly and Ysbyty Aneurin Bevan being built in Ebbw Vale, Blaenau Gwent. A smaller general hospital would still be based in Newport, if the Cwmbran option was chosen. Catherine O'Sullivan, chief officer of Gwent Community Health Council (CHC) said Clinical Futures was a "pioneering model", which was in line with current guidance and good practice and was "widely supported" by the public. "The implications of this decision is that Gwent will now have to try and implement the new model across a hospital estate which, in part, will remain outdated and unfit for purpose. Under these circumstances the implications for patients in any 'plan B' will need to be carefully scrutinised." I don't know what others might think. But when you come up with not only a state-of-the-art proposal, but one that has received almost universal support from health professionals and the public alike, it is hard to avoid the conclusion that "look again" is thinly disguised code for "we can't quite afford it". If the programme really is as wonderful as Rhodri Morgan claimed only this week, then Edwina Hart's problem can't be with "ambitious" or "right", but only with the dreaded word "deliverable". So it's well worth asking the question why we can't afford it. The answer is this. The One Wales Government made a policy commitment not to use PFI as a funding mechanism for new NHS capital projects. I think this is a good thing, but in order to be able to make infrastructure improvements an alternative model is needed. In the absence of such a model, the projects have been funded out of the Block Grant we get from the Treasury. This is not so illogical. We get some £15bn each year, so a hospital or two like Ysbyty Ysrad Fawr or Ysbyty Aueurin Bevan can be funded from it. But there is a limit to how many projects can be funded this way. Mr Swinney [the Scottish Finance Minister] said: "We have the money to pay for this crossing through our traditional capital budgets. We have £3.5bn of a capital expenditure programme every year and the Forth replacement crossing will cost us about £1.7bn over a five to six-year period." But he added: "The cost of doing that is that there would be, unfortunately, delays to other projects. That's why we're trying to get the Treasury to give us the type of flexibility that any other normal administration would have by being able to borrow to pay for a once-in-a-generation project like the Forth replacement crossing and spread those payments over a period of years." Mr Swinney went on to say the Scottish Futures Trust worked in relation to projects such as healthcare developments and school buildings, rather than a single, "generational" build, such as the new Forth crossing. Now, I'm not entirely sure whether I believe the line that the Scottish Futures Trust was not designed for larger projects of this nature. I think it is much more a case of them having extraordinary difficutly in getting it off the ground when it is being so vehemently opposed by the UK Government. Westminster wants to see it funded by a PFI/PPP arrangement ... quite simply because that's how Labour and the Conservative prefer to do things, and they want to embarrass the SNP into a U-turn. Of course the chances of that happening are nil. Which brings us neatly to the Holtham Commission. To put it at its bluntest, Labour have got to find some way of honouring their commitment not to use PFI in Wales. They have to find an alternative mechanism for infrastructure funding, and this can only be by allowing some form of borrowing. That's what the Holtham Commission is for. But if they agree it for Wales, then they surely must allow the same sort of thing for Scotland too. Today, the WM had an article about Plaid Cymru's submission of evidence to Holtham, which I've mentioned here. 32. As part of a move to fiscal devolution the Assembly Government should have borrowing powers within a prudential borrowing framework: after all local authorities already have such borrowing powers although their revenue raising powers are extremely limited. The Assembly Government should be able to raise money in the capital markets in a similar way to devolved administrations in other parts of the world. The rating agencies would take a view as to the credit worthiness of any such issuance of debt and this, in turn, would constrain the Assembly Government to prudent borrowing. In practice it is probable that the UK Government would wish to set further constraints or limits and this should be on the basis of the Assembly Government being able to have borrowing limits in line with its proportion of total UK public expenditure. 33. There is also potential for the Assembly Government to use its ability to assume contingent liabilities up to the value of the block grant. This enables the Assembly Government to provide guarantees to third parties under certain circumstances and could be used for funding of capital investment in the public sector. 34. In the case of borrowing powers and contingent liabilities it would greatly facilitate matters if the funding of the Assembly Government were placed on a statutory basis: this should be done. Holtham is not due to produce an interim report until this summer ... and who knows when it will deliver the final report, or whether the government in Westminster will take a blind bit of notice? We are in the middle of a financial crisis. The UK government has just bailed out banks for the second time, and owns huge chunks of some. They have told us that one of the ways they want to kick start the economy is by bringing forward infrastructure investment programmes ... yet here is one that is being put on hold. An obvious discrepancy between words and action. But isn't this the same British government that is eager to find projects to bring forward to spend like fury so that it can kick-start the economy with a big fiscal boost? On BBC Radio Scotland yesterday, Ms Cooper's boss, the Chancellor, Alistair Darling, responded to the SNP idea: "Their particular scheme where they were asking to borrow money from budgets which are yet to be allocated over an extremely long period - that's something that we simply don't do". Really? Is he sure? Isn't that what government borrowing is all about? Isn't that exactly what has happened with PFI/PPP contracts signed for at least 25 years? The missing link in this argument is the inability of the Scottish Government to issue bonds. Councils can do so, and the rail operators can borrow to build the Government's priority projects. But the Treasury has never liked the possibility that an irresponsible Scottish administration could breach the UK's borrowing targets. That argument doesn't look so strong these days. It is hard to imagine any Scottish government so irresponsible that it breaches borrowing limits on the scale Mr Darling has achieved in recent weeks. From this story on the BBC today, it looks as if the need for investment in health service buildings is even more dire. About £500m worth of work that needs to be done on NHS buildings in Wales. They make the point (which must be obvious to everyone) that if repairs keep getting put off, the buildings deteriorate to the point where it costs much more to repair them later. So despite the £300m a year they spend, the backlog of repairs still necessary has only gone down by £12m in the last year. £226m is described as needed for high or significant risk work.